Signs suggest oil prices are likely to head higher again, so here are three companies that offer investors a relatively low-risk way to profit from that rebound. Let's face it, oil stocks have been bludgeoned over the past year due to the persistent oversupply of crude on the market. The SPDR S&P Oil & Gas Exploration & Production ETF (NYSEMKT:XOP), which tracks 75 U.S. oil and gas producers, is down more than 36%, largely paralleling the slide in the price of crude. 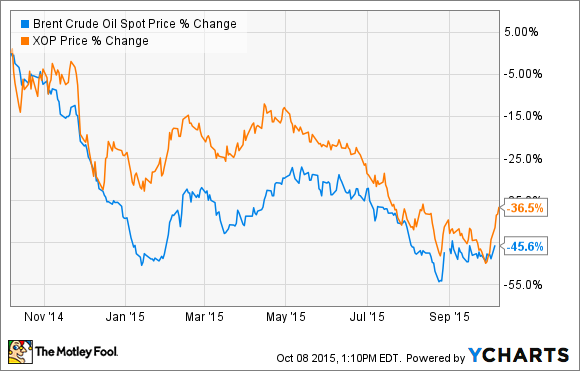 That suggests that when the price of oil rebounds, it should take those stocks higher. So, with signs on the horizon that oil could head higher, here are three stocks you can pick to take advantage of the rise. Chevron (NYSE:CVX) is one of the biggest oil companies in the world. Not only does it have oil and gas operations that span the globe, but it is diversified into refining, chemicals and midstream. Those assets produce a lot of cash flow, even when oil prices are lower. Furthermore, Chevron also has a strong, investment-grade rated balance sheet, which gives it the financial flexibility to weather almost any storm. These attributes really help to limit the downside risk. That said, the stock has sold off over the past year. 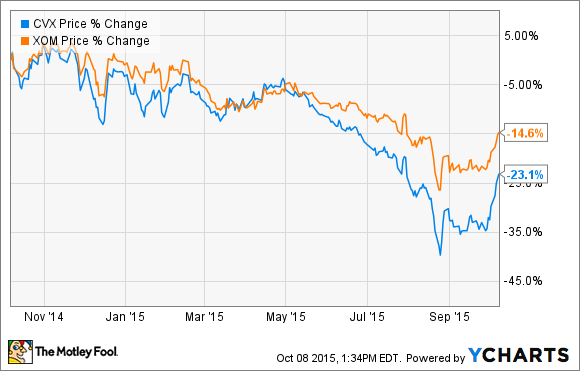 It's down 23%, a much steeper decline than big oil peer ExxonMobil (NYSE:XOM). Having said that, as that chart shows, Chevron's stock has started to rally in recent weeks as the price of oil has moved higher. Should crude prices continue their upward momentum, they should take Chevron's stock along for the ride and likely outperform ExxonMobil. Add it all up, and Chevron is a safer stock pick that has limited risk, but still a decent reward. In a lot of ways, ConocoPhillips (NYSE:COP) is like Chevron, as it too has a diversified global oil and gas platform. Furthermore, it has a pretty solid investment-grade credit rating. About the only key difference is that it's not integrated like Chevron -- the company jettisoned its refining, midstream, and chemical businesses a few years ago to focus on exploration and production. As such, it comes with a bit more risk, though its stock is only down 24%, which is about in line with Chevron's slide. However, because of its focus and smaller size, it has much more flexibility when it comes with investing in oil and gas projects. Furthermore, it has a lot more exposure to North American shale plays, which are both shorter cycle and offer higher returns, as detailed in the slide below. In other words, if oil prices rebound, ConocoPhillips has the flexibility to quickly ramp up its investment in North American unconventionals and capture that upside. So, while it has a bit more risk than Chevron has due to not being quite as diversified, it has more upside due to its exposure to its position in the fast-growing shale arena. Like ConocoPhillips, EOG Resources (NYSE:EOG) is a pure exploration and production company. However, it's not quite a global behemoth, as it is primarily focused on the three key oil-rich U.S. shale plays: Bakken, Eagle Ford, and Permian Basin. That focus adds a bit more risk, though its balance sheet is still among the strongest in the sector, so it's not that risky. That's one reason its stock price is only down 8% over the past year. While that might appear to suggest that its upside is limited, that's not the case at all. That's because EOG Resources has even more flexibility, as it cut its spending deeply enough that its production won't grow at all this year. It did so because it refuses to grow oil production into an oversupplied market. That said, it is ready to deliver growth as soon as conditions improve, which is why it is drilling but not completing hundreds of wells. Once oil reaches its target price, the company will resume strong double-digit production growth to capture that upside, which should lead to strong upside in its stock price, too. There are hundreds of oil companies in the U.S. that will benefit from rising oil prices, and some might rise a whole lot higher than these three stock picks. However, few offer the compelling combination of strong upside potential and limited downside risk that we see in these three top-tier oil producers.